Wondering how many people fit at a banquet table? Or how to setup banquet tables? Use our banquet table & chair setup guidelines. Need more than 10 at a round table? This is how many will fit comfortably. Standard table height is 29"-30". All of our folding tables are 29" or 30" in height, UNLESS otherwise noted. For banquet dinners and other functions when people will sit on both sides of the table, 30" is the most common table width. Wood tables are also available special order in 36" width. These are not commonly ordered, because most event planners need to utilize their space efficiently. 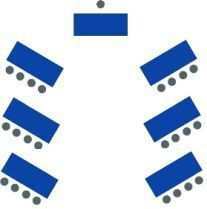 If aligning 8 foot banquet tables end to end, you may add 1 chair for each "joint" on each side. (See picture to right) This should only be done if space is limited. In order to maximize the amount of round banquet tables you can fit in a room, place them as illustrated in the picture to the right. 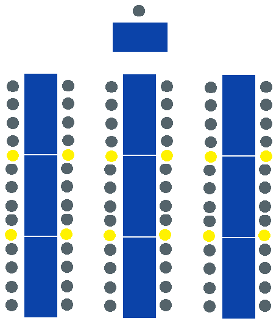 Diagonal placement is more space efficient than lateral rows. Classic banquet style table placement consist of long rows of rectangle banquet tables with seats on both sides. This setup will allow for the most seats in a room. 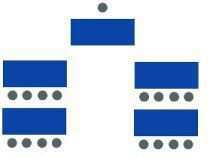 Notice in the picture an extra person is added at the "joint" of each table. The setup allows for a head table to be placed at the front of the room, like shown in the illustration. The picture illustrates banquet style with round tables. 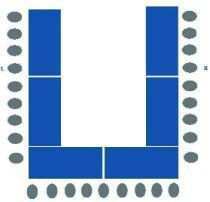 Notice the rows are off center in order to maximize seating. Conference style is great for critical thinking discussions. This is the most productive setup when decisions need to be made. You finally have the board of directors all in one place, so develop your action plan in great time. Common setup includes 4 eight foot tables. Conference style is NOT ideal for groups of more than 30 people. For groups of more than 30 and discussion/interaction needs to be made, U shaped is ideal. The illustration below is setup for 22 people. 4 30x96 tables are used, and it utilizes 1 extra chair at the "joint" of the tables. Hollow square setup is much like conference style, except the inside of the square is hollow. 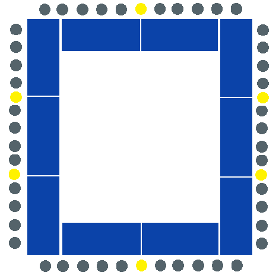 The illustration shows a hollow square setup for 50 people using 10 30x96 tables. Dimensions are 21 ft x 24 foot. 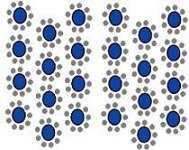 The hollow square diagram below utilizes serpentine tables at the corners. The illustration is setup for 44 people. 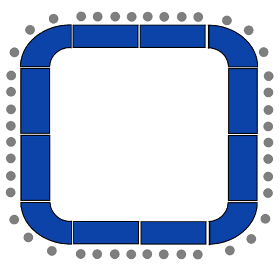 It uses 4 serpentine tables, and 8 30x96 rectangle tables. 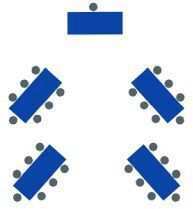 The picture shows a U-Shaped setup for 27 people using 6 30x96 tables. The U shaped setup works well for presentations where there will be interaction between the guests, and the speaker. The speaker can walk up and down the hollow box inside the "U" interacting with the guests. This style setup can be used for meetings, dinners, or watching films. When setting up "U" shaped, you may place a video projector etc. at the front of the hollow part of the "U". 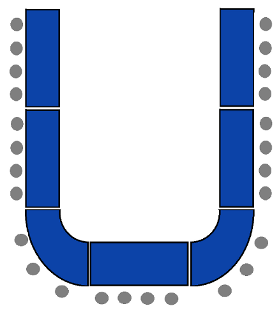 The U Shaped diagram utilizes serpentine tables at the corners. The diagram is setup for 26 people. It uses 8 8 foot tables, and 2 serpentine tables. You may also place the head table inside the legs of the "U" like shown in the picture to the right. This table placement adds 3 seats to the head table. The U shaped plus style can be used when space is limited. Chairs are placed in the "hollow" part of the U. This is takes away some of the advantages of the hollow part of the U. IMPORTANT! 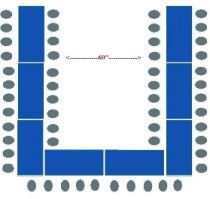 In order to setup like this, you need to have either the head table inside the "U" or more than 2 8 foot tables for the head table. Otherwise there will not be enough room for the chairs inside the "U". Theatre style banquet setup is the most space saving design. If your event is a speech or lecture, this is the setup for you. You may administer this setup for watching films, or performances. Banquet chairs are faced towards the head table in front of the room. The classroom style setup is great for orientations or any other presentation when the guest will need to be writing/eating while observing. Our seminar tables are most suitable for saving space with this setup. Seminar tables have a smaller width than standard banquet tables. V shaped setup is much like classroom style, except for the tables are tilted toward the speaker. Auditorium style setup is very similar to theatre style. The chairs in the outer area are angled toward the speaker more so than the inner. Herringbone style setup is for dinners that will involve a speaker. The alignment of the tables allows for most guests to be comfortable while facing the speaker. The tables are turned at an angle toward the head/speaker's table. Chairs are placed on both sides of the tables. If using your standard 8 foot banquet tables, it is recommended to place 3 chairs on each side due to some guest wanting to turn their chair a little more. Placing 4 chairs on each side is perfectly fine if need be. Semi circle setup is great for meeting when interaction is needed with the speaker.The setup to the right is an illustration of semi circle setup using 8 foot rectangle tables. The tables have seats only on 1 side. 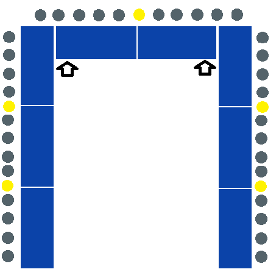 There is a head table, or podium at the front of the open part of the circle. 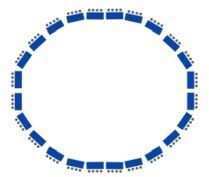 The illustration is a semi circle diagram for 48 people, and uses 12 8 foot tables. Circle style is much like semi circle except the circle is completely closed off. The illustration to the right is for 96 people, and utilizes 24 8 foot tables.